Croatian /kroʊˈeɪʃən/ ( listen) (hrvatski [xř̩ʋaːtskiː]) is the standardized variety of the Serbo-Croatian language used by Croats, principally in Croatia, Bosnia and Herzegovina, the Serbian province of Vojvodina and other neighboring countries. It is the official and literary standard of Croatia and one of the official languages of the European Union. Croatian is also one of the official languages of Bosnia and Herzegovina, a recognized minority language in Serbia, and neighboring countries. However, this first linguistic renaissance in Croatia was halted by the political execution of Petar Zrinski and Fran Krsto Frankopan by the Holy Roman Emperor Leopold I in Vienna in 1671. Subsequently the Croatian elite in the 18th century gradually abandoned this combined Croatian standard. There is no regulatory body that determines the proper usage of Croatian. The current standard language is generally laid out in the grammar books and dictionaries used in education, such as the school curriculum prescribed by the Ministry of Education and the university programmes of the Faculty of Philosophy at the four main universities. In 2013, a Hrvatski pravopis by the Institute of Croatian Language and Linguistics received an official sole seal of approval from the Ministry of Education. Attempts are being made to revive Croatian literature in Italy. ↑ Hammarström, Harald; Forkel, Robert; Haspelmath, Martin, eds. (2017). "Croatian". Glottolog 3.0. Jena, Germany: Max Planck Institute for the Science of Human History. ↑ E.C. Hawkesworth, "Serbian-Croatian-Bosnian Linguistic Complex", in the Encyclopedia of Language and Linguistics, 2nd edition, 2006. ↑ "Croatia: Themes, Authors, Books | Yale University Library Slavic and East European Collection". Library.yale.edu. 2009-11-16. Retrieved 2010-10-27. ↑ Gazi, Stephen (1973). A History of Croatia. New York: Philosophical library. ISBN 978-0-8022-2108-7. ↑ Van Antwerp Fine, John (2006). When Ethnicity did not Matter in the Balkans. Michigan, USA: University of Michigan Press. pp. 377–379. ISBN 978-0-472-11414-6. ↑ Kalsbeek, Janneke (1998). "The Čakavian dialect of Orbanići near Žminj in Istria". Studies in Slavic and General Linguistics. 25. ↑ "Matica Hrvatska - Dva brata i jedna Sirena". Retrieved 9 March 2012. ↑ "Matica Hrvatska - Putni tovaruš - izvornik (I.)". Retrieved 9 March 2012. ↑ Tanner, Marcus (1997). Croatia: a Nation Forged in War. New Haven, USA: Yale University Press. p. 50. ISBN 978-0-300-06933-4. 1 2 3 Malić, Dragica (1997). Razvoj hrvatskog književnog jezika. ISBN 978-953-0-40010-8. ↑ Uzelac, Gordana (2006). The development of the Croatian nation: an historical and sociological analysis. New York: Edwin Mellen Press. p. 75. ISBN 978-0-7734-5791-1. ↑ Bičanić et al. 2013, p. 77. ↑ Bičanić et al. 2013, p. 78. 1 2 3 Corbett & Browne 2009, p. 334. ↑ Cvetkovic, Ljudmila. "Serbian, Croatian, Bosnian, Or Montenegrin? Or Just 'Our Language'? – Radio Free Europe / Radio Liberty © 2010". Rferl.org. Retrieved 2010-11-01. ↑ Benjamin W. Fortson IV, Indo-European Language and Culture: An Introduction, 2nd ed. (2010, Blackwell), pg. 431. ↑ Stokes 2008, p. 348. ↑ Šute 1999, p. 317. 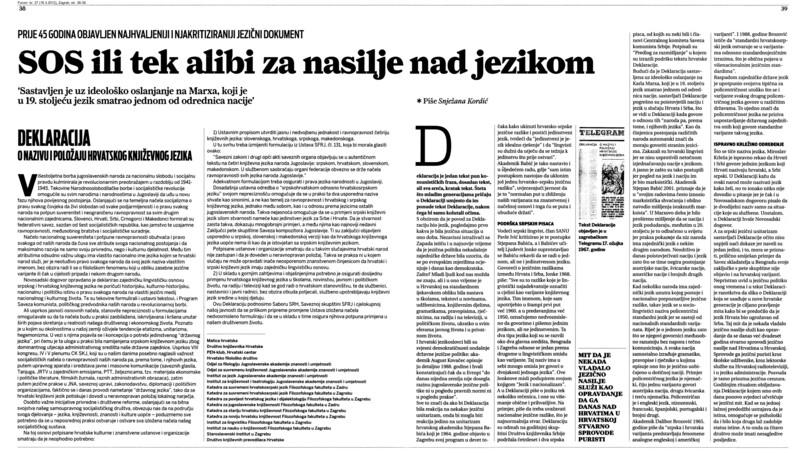 ↑ "Vandoren: EU membership – challenge and chance for Croatia – Daily – tportal.hr". Daily.tportal.hr. 2010-09-30. Retrieved 2010-10-27. ↑ "Applications for Croatian linguists". EU careers. 2012-06-21. Retrieved 2012-09-10. ↑ "Službeni list Europske unije" [Official Gazette of the European Union] (in Serbo-Croatian). European Union. Retrieved 29 January 2013. ↑ "Croatia". Cia.gov. Retrieved 2010-12-21. ↑ "Ethnologue report for Bosnia and Herzegovina". Ethnologue.com. Retrieved 2010-12-21. ↑ Kinda-Berlakovich, Andrea Zorka (2006). "Hrvatski nastavni jezik u Gradišću u školsko-političkome kontekstu" [Croatian as the Language of Instruction and Language Policy in Burgenland from 1921 onwards]. LAHOR. 1 (1): 27–35. ISSN 1846-2197. ↑ "Endangered languages in Europe: report". Helsinki.fi. Retrieved 2010-10-27. ↑ "www.puma.vojvodina.gov.rs". Puma.vojvodina.gov.rs. Retrieved 2010-12-21. ↑ "Structura Etno-demografică a României". Edrc.ro. Retrieved 2010-10-27. ↑ "Structura Etno-demografică a României". Edrc.ro. Retrieved 2010-12-21. ↑ "From Gordon, Raymond G., Jr. (ed. ), 2005. Ethnologue: Languages of the World, Fifteenth edition. Dallas, Tex. : SIL International". Ethnologue.com. Retrieved 2010-01-26. Corbett, Greville; Browne, Wayles (2009). "Serbo-Croat - Bosnian, Croatian, Montenegrin, Serbian". In Comrie, Bernard. The World's Major Languages. Routledge. ISBN 9781134261567.